Sequel to Bill & Ted's Excellent Adventure (89). As established in the previous film, paradise on Earth exists 700 years in the future due to the influence of Bill & Ted (Alex Winter & Keanu Reeves), a couple of slackers from 1989. However, in 2691 A.D., there is a faction led by a disgruntled fascist named Chuck (Joss Acklund) which denies this utopia. Chuck sends a couple of android duplicates of Bill & Ted to 1991 so that they will kill the two moronic heavy metal wannabes. Chuck happens to be the ex-teacher of Rufus (George Carlin, reprising) and, in traditional villain mode, announces his plans to him; Rufus also goes time traveling to warn his buddies but gets lost. 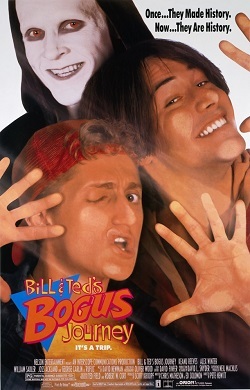 Meanwhile, in 1991, Bill & Ted plan to hit it big in a concert and Ted's dad still wants to send him to military school; the two dudes also are going out with the girls from medieval Britain (played by different actresses) and live in an apartment (how they afford this is not explained).